Sony isn't one to be left behind when it comes to the latest crazes. Its NEX cameras were released earlier in the year in response to other manufacturer's compact mirrorless camera offerings. Now the company has moved to introduce a new genere of SLR-style cameras with electronic viewfinders. This is where the Sony A55 body fits in, being an electronic viewfinder camera that can accept the range of Sony Alpha-mount lenses. It's not quite the same as the offerings you'll find from Panasonic digital cameras, Samsung et al, as it's not a mirrorless camera. Interestingly Sony has chosen to implement a translucent mirror system in the Sony A55 body, which allows for fast phase detection autofocus during live-view, and also while recording video. Translucent mirrors are nothing new, and were first seen in Canon's Pellix 35mm SLR back in the mid-1960s, although Sony's implementation of this technology is quite novel. As the mirror is translucent, it remains in the optical path at all times, directing a third of the light to the autofocus sensor, whilst allowing the other two thirds to pass through to the imaging sensor. The advantage of this design is that the camera can use the phase detection AF system in live view mode instead of the slower contrast detection system that is employed by other cameras when images are composed on screen. It also allows the camera to be more lightweight and avoids the problem of mirror-induced vibrations. Unfortunately as the mirror causes a loss of light available for imaging, the design will mean slightly higher sensitivities will be required for the same exposure, which may result in grainier pictures. In addition, the loss of light would mean that an optical viewfinder would be quite dim, so Sony has opted to employ an electronic viewfinder (EVF) in the Alpha 55 and Alpha 33. With the Sony A55 price at £800 (including the 18-55mm kit lens) at its launch, the current Sony A55 price on the high street has already dropped to around £700, which is a similar price tag to SLR cameras geared towards the enthusiast, or a beginner after a few more features. 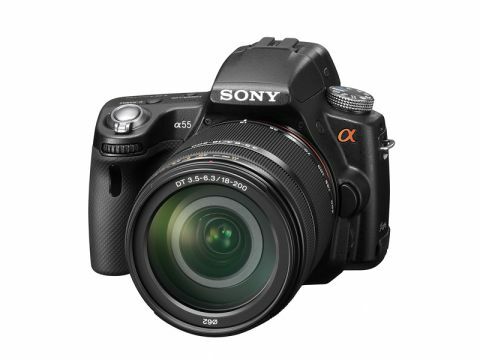 Other cameras in the Sony A55 price bracket include the Nikon D90 or the Canon EOS 550D which offer many similar features, such as a high resolution sensor and HD video, but have optical viewfinders.